Staff Sgt. 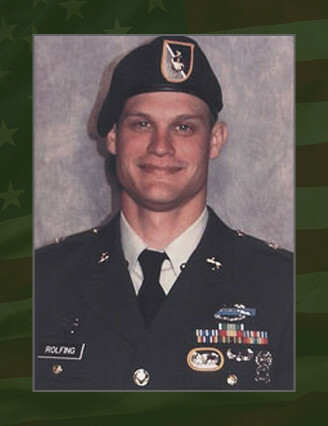 Robb L. Rolfing, died from wounds sustained while conducting combat operations in Baghdad, Iraq, June 30, 2007. He was a Special Forces engineer sergeant assigned to the 2nd Battalion, 10th Special Forces Group (Airborne) in Fort Carson, Colo.
Rolfing, 29, was killed by small arms fire while deployed to Iraq in support of Operation Iraqi Freedom as a member of the Combined Joint Special Operations Task Force – Arabian Peninsula. He was born Dec. 4, 1977, and was a native of Sioux Falls, S.D. Three years after graduating from Vassar College, in Poughkeepsie, N.Y., with a degree in astronomy, Rolfing enlisted in the Army in January 2003 as an infantryman. Upon completing basic and advanced individual training at Fort Benning, Ga., he was assigned to Company B, 3rd Bn, 187th Infantry Regiment at Fort Campbell, Ky., and joined the “Rakkasans” in Iraq as an automatic rifleman on his first deployment. In 2004, he was selected to attend the Special Forces Qualification Course at Fort Bragg, N.C. He graduated from SFQC and earned the Special Forces tab in 2005 and was then assigned to 10th SFG(A). Rolfing’s military education includes the Warrior Leaders Course, Basic Noncommissioned Officer Course, Basic Airborne Course and the Basic Air Assault Course. His awards and decorations include the Army Commendation Medal, Army Achievement Medal, Good Conduct Medal, National Defense Service Medal, Iraq Campaign Medal, Global War on Terrorism Service Medal, Global War on Terrorism Expeditionary Medal, Noncommissioned Officer Professional Development Ribbon, Army Service Ribbon, Combat Infantryman Badge, Parachutist Badge, Air Assault Badge and the Special Forces Tab. Rolfing is survived by his parents Rex and Margie Rolfing, his brother Todd Rolfing, and his sister Tiffany Rolfing of Sioux Falls, S.D.